Last time I wrote I was about to cross the border. Into the Wild Wild East of Guatemala, the land of cowboy hats and boots. To one of the regions in Guatemala that holds a big piece of my heart. Chiquimula. A friend had invited me to an event in the community, Las Flores. Omar had not given me more details, only “that I needed to be there”. The event was on the 8th of March. Carlos vive, la lucha sigue sigue!! 8th of March, the day Carlos Hernandez was assassinated. Three years ago. Carlos. He had stepped on too many powerful toes. On his way home in his pick-up truck he was stopped by two men on a motorcycle and shot dead in a rain of bullets. I liked Carlos. He was a friend. 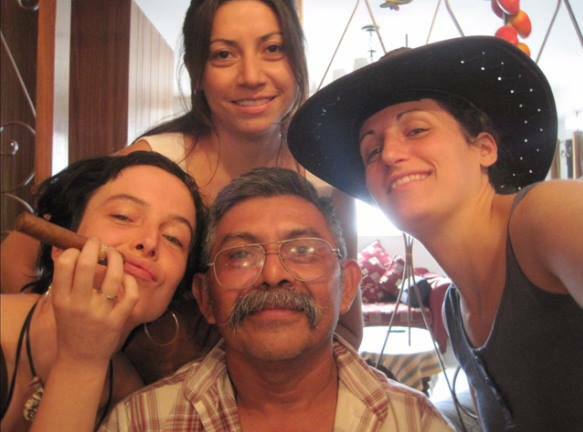 He was a union leader, an environmental activist, and defended the campesinos, the indigenous ch’ort’i and about anyone else worth defending. His struggles were a bit all over the place, as were his stories. PBI-Guatemala accompanied him the time I was working with them, in 2010. I remember the first time I met Carlos. It was my first accompaniment, the first “acompañado” to meet. After a meeting of the health union in the hospital, he set off on a talk where global capitalism, health care, Guatemalan politics, activism, local power struggles and threats he had received mixed in random order. 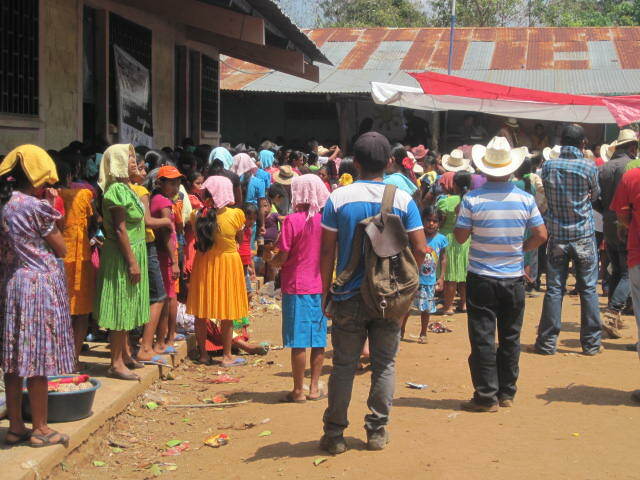 In the scorching heat of Chiquimula it was difficult to make sense of it all. The last time I saw Carlos I visited the region alone. We had some walks, talks and dinner together, he gave me a bottle of honey, told me I should get married with a local stud from the area, told me about the many death threats he received. Still nobody has been held accountable for his death. Local police were quick to determine it was a crime of passion. Curiously this seems to be the cause of death of many human rights activists. The investigations on Berta Caceres murder are also aiming for that conclusion. At least with Berta there is (still) pressure to hold those responsible accountable. But Carlos became another number in the statistics of Guatemala’s notoriously high level of impunity. But here in Chiquimula Carlos is still remembered. The event in Las Flores on the 8th of March honored Carlos. And Woman and their struggle. The 8th is Woman’s Day. 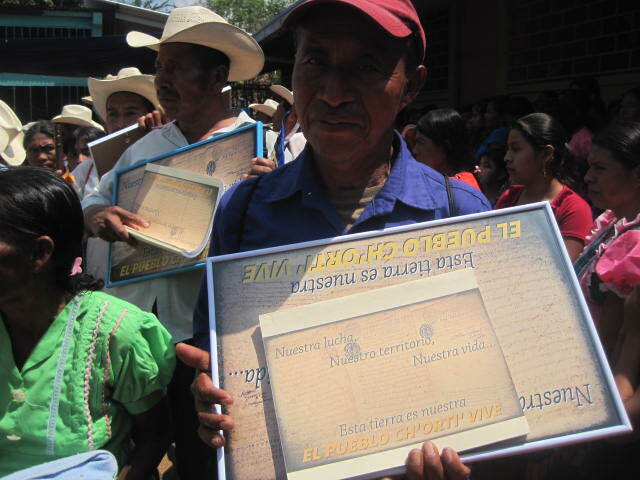 This day was a very special day in the history of Las Flores and the resistance of the Ch’ort’i community. This day was chosen to transfer the original community titles to the native Ch’ort’i people. I visited Las Flores the first time six years ago, accompanying Omar. The community was resisting a hydroelectric dam project planned to be built on their land. The community’s struggle highlighted the need to be legally considered the rightful owners of their territory, to obtain community titles of the land they had rightfully lived on for centuries. The interests behind the dam project aimed to claim ownership of the land that was not yet registered as owned by someone. Another strategy was to try buying individual land titles from people that owned some land. These strategies are based on the very Western concept of private property, destroying the indigenous perception of communally owned land. It divides the communities, geographically and socially. Such “development” projects are based on the capitalist premise that resources, such as land and rivers, should be exploited for profit. For many indigenous peoples the land and its resources are intimately connected with one’s identity, one’s community and people. Something to take care of, something to receive from and give to, something to maintain in balance as it guarantees the balance of the community. Six years later, after a long process of digging in anthropological studies and Spanish colonial archives the Ch’ort’i were able to demonstrate that centuries ago they had been granted ownership of the land by the Spanish crown, land they had always lived on long before the Spanish came. Ironically the bureaucracy of the first colonization process could be used as a weapon against another colonization process. The day was long, the heat unbearable. But the whole community stood for hours in the blaring sun patiently listening to endless speeches from an endless variety of people deemed important. 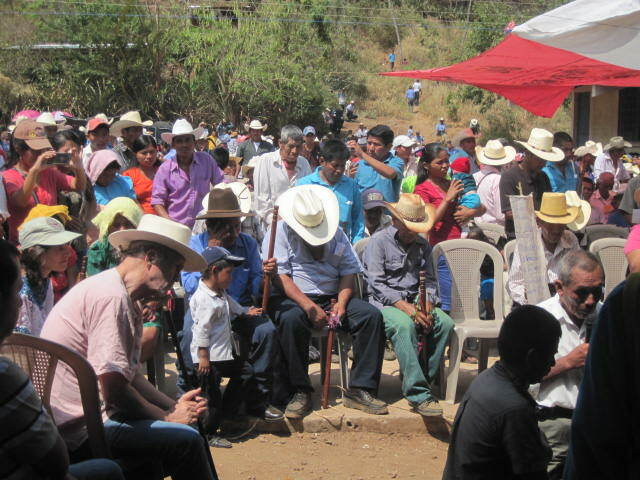 Known leaders from the community and area but also many indigenous, peasant and social movement leaders for different parts of Guatemala that most people present probably saw for the first time that day. The women stood in their colorful dresses on both sides in the little shade to be found. In the middle a coming and going of community members until the big moment was finally there. The Ch’ort’i consider themselves a very proud and fierce people. Indeed, the instant the colonial community titles were finally handed over their faces shone with pride. The community elders stood proud with a copy to be carried to their hamlets. With their fingerprint each and every member signed an act to be taken to the Land Registry. Gradually people moved in line for the food that was being served to celebrate. And the marimba orchestra started playing. The struggle and pride of the Ch’ort’i seemed to have changed something else in this region since I last visited. Six years ago I hardly ever heard people talk Ch’ort’i, I was told only a few remained that spoke the language. Now many locals addressed their community in Ch’ort’i. Before, and in contrast to most other parts in Guatemala, I had never seen the Ch’ort’i celebrate their Maya prayers. I was told most of these traditions were lost here. Now, after a few words by the local catholic and protestant priests who had joined them for years in their struggle, there was a long Ch’ort’i worship. 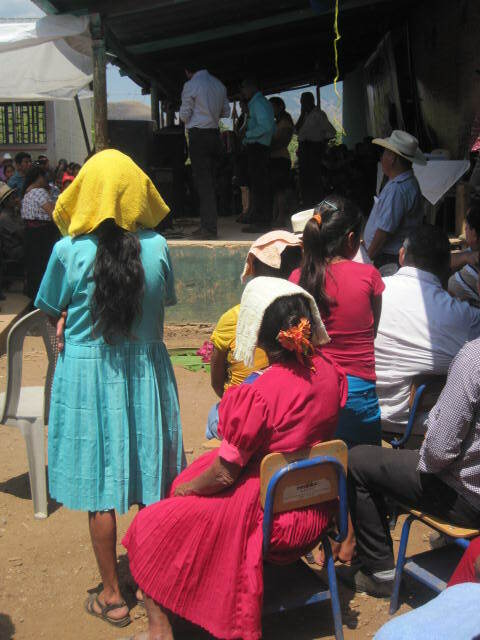 Years ago I had never seen a communal meeting where men and women carried the typical Mayan sticks to indicate they are community authorities. Today they hold their sticks proudly. Certainly, the fact that I have not heard and seen these things before does not mean they did not exist or happen. But in so many aspects the whole event breathed an air of cultural pride that I did not perceive before. It seems that years of resistance led to an awakening of cultural revival. That revival also comes with an appreciation of what is gone. After the event we sat at Omar’s family home. A Ch’ort’i woman in traditional dress sat with us lamenting the loss of the Ch’ort’i traditions. Regretting how much of her grandmother’s knowledge had been lost, to her en her people. She expressed her gratefulness for the knowledge she as an illiterate woman is receiving through this struggle she joined. The knowledge about the value of her land, its resources, her culture. She told us how her struggle is also about spreading this knowledge into her community. This woman on Omar’s terrace was the living example that with knowledge also comes the awareness of what is not known, of what has been lost. But still, that knowledge also carries with it the seeds for resurgence, reinvention, reaffirmation. So many stories, in Guatemala and Honduras, are about death, fear, violence, repression. I was so immensely grateful to have been there that day on that moment in Las Flores. To me it confirms that resistance is not futile. Sure, the road is long and probably endless. 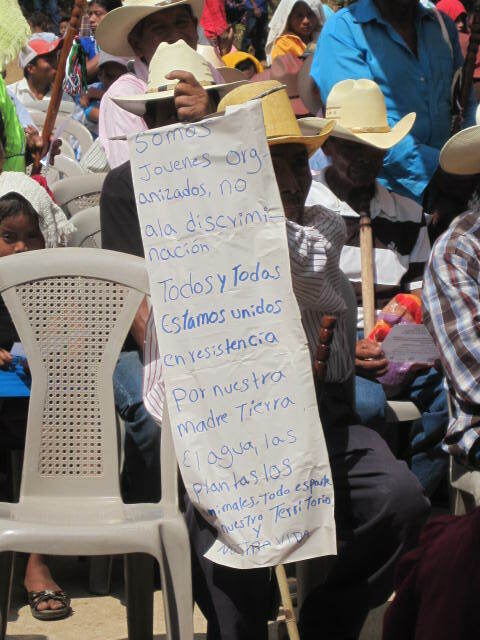 Even after six years of sometimes very fierce struggle the plans for the hydroelectric dams in Las Flores are still there, but still the dams are not. The community has recovered its original Spanish colonial land title but this is only the beginning of a long juridical process to be recognized as the only, rightful and indivisible owners of their communal lands. Certainly the Ch’ort’i will still have to face a lot of repression, still I am sure they will not be destroyed, they will flourish. Next Post I stand with …. Ha Frauk, het feit dat dit persoonlijk voor jou is spat van je verhaal af! (Zal ik mijn eigen liefde voor Chiquimula behalve van Carlos ook van jou over hebben genomen?) Wat bijzonder dat je erbij kon zijn en dat, ondanks constante bedreiging en verlies, er toch ook zoveel trots en positiviteit naar boven komt! Good to see an evolution of emancipation . Community land is a right to keep.